As wildfires continue to devastate areas of California, it seems incredibly timely for the debut of a populist firefighter tribute full of bombast and manipulation. Thankfully, Only the Brave is not that movie. Director Joseph Kosinski seems well aware of overwrought pitfalls so easily indulged, taking care to deepen our connection to major players as events build to a terrifying, true-life conclusion. Based on the GQ article “No Exit,” co-writers Ken Nolan and Eric Warren Singer deftly adapt the story of Arizona’s Granite Mountain Hotshots, the first group of municipal firefighters to achieve elite “Hotshot” status. Josh Brolin stars as supervisor Eric Marsh, a firefighting vet trying to ready his seasoned pros and new recruits for both the upcoming season and the essential state evaluations. Rookie Brendan McDonough (Miles Teller) is the team’s biggest question mark, a recovering drug addict and new father who’s determined to turn his life around. While filmmaker Peter Berg has perfected a successful formula of quick character intros, then frenetic action for his “unsung hero” films (Deepwater Horizon, Patriots Day), Kosinski (Oblivion) is committed to a separate but equally effective path. There are cliches here, such as a frequent “lost cause” metaphor and the obligatory stoic women standing by their men, but Kosinki and his writers are able to keep them in the background through an emphasis on intimate storytelling. We see the fires battled in often spectacular fashion, but we also come to feel the toll the job takes on family life. We learn firefighting tactics along with the newbies, and as Brendan fights to prove his worth to the mother of his child (Natalie Hall), Teller finds a nicely subtle groove to get us on Brendan’s side as well. Even better are Brolin’s scenes with Jennifer Connelly as Marsh’s wife Amanda. Through these two skilled actors and some pointed dialogue, a couple’s fight to hold on to each other feels authentic, and the film finds an emotional core that will pay later dividends. 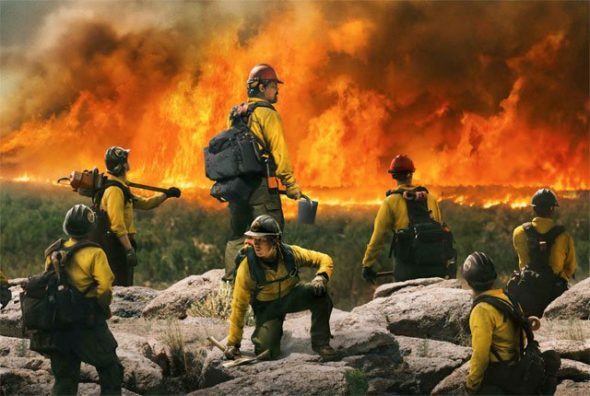 Often powerfully gripping and thrilling to watch, Only the Brave is a fitting salute to real people that deserve one.